The smart folks at Shopify – who help you make Ecommerce sites – have a great post with Important Shopping Dates for 2013 that is right on point. We loved the idea of planning ahead and taking advantage of trends, seasonality and popular search terms to make the most of your content. So we wanted to this with our Shareaholic bloggers plus give some tips on how this can help you efficiently plan your content in 2013. On Tuesday we recommended that you checked out your Shareaholic Analytics to identify your top performing blog posts, and identify your strengths. 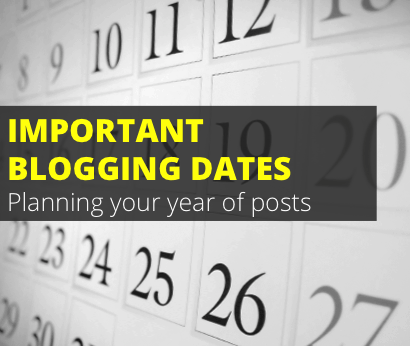 Depending on the type of blog you have, some of your more seasonal posts may show up in that report, proving that the topic could be worth a fresh visit in 2013 if it was successful in 2012. You clearly already know when the important calendar dates such as holidays are, but it’s important to keep in mind that your readers begin preparing for them weeks or sometimes even months in advance. A quick search in Google Trends will show you when interest spikes for a particular topic. Let’s take pumpkin pie recipes for example. They are certainly more popular around Thanksgiving, but Google Trends shows us that search volume for them begins to pick up as soon as late August. Bloggers have an opportunity to share their best pumpkin pie recipes earlier in the fall and beat the crowd. Be the first one to be pinned, shared and linked to. Clearly the pumpkin pie recipe applies best to food bloggers, but any kind of blogger can prepare themselves to take advantage of these seasonal opportunities. To keep important dates top of mind for you, take a look at Shopify’s calendar. Any conferences you’re looking forward to. Your blog anniversary. (See this nice post from Shareaholic publisher Dollops of Diane commemorating hers!) It’s a perfect opportunity to thank your readers and celebrate your accomplishments! Food bloggers – there is a national food holiday in every month of the year. Check out this list. Are you tracking any holidays, trends or seasons to plan for your content? What else would you add to the calendar? Let us know in the comments!